Guffey, Colorado in the late 1800’s. 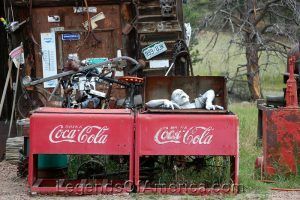 In southern Park County Colorado, about 33 miles north of Canon City, just off Highway 9, Guffey is a ghost town with a twist of quirkiness, making for a fun visit. The old Garage in Guffey no longer does repairs, but has become a collection of oddities. Photo by Dave Alexander, 2018. At an elevation of 8,700, this area was explored by John C. Fremont on his return from California in 1844, and some settlers are said to have arrived here in the 1870s, though the primary population of this region was the Ute Indian Tribe. The town started in 1890 with a whole lot of promise. Prospectors, looking for the next big gold strike, like the one in Cripple Creek, established the mining camp as Idaville, but soon changed its name to Freshwater. When the town was incorporated in 1895, it was already booming as a mining, lumbering and ranching community. It was the center of activity for the Freshwater Mining District, which in addition to gold, produced copper, lead and other minerals. 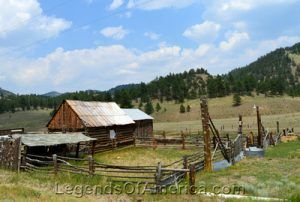 An old homestead in Guffey, Colorado. Photo by Kathy Weiser-Alexander, 2018. In the late 1890’s, the name of the town was changed again due to another Freshwater in California. This time they named it after James McClurg Guffey, and oilman and capitalist. Guffey was known throughout the region for its dances, which included lots of fiddlers and other musicians. It reached its peak during this period, with over 500 residents and 40 businesses. Most brought here with the promise of Gold. It wouldn’t be long until Guffey began losing its population. Today the community has only around 49 residents, and relies heavily on Tourism. Several original structures remain, and are even occupied. Others have been kept up, though empty. The town has a charter school, restaurant, small museum and more. 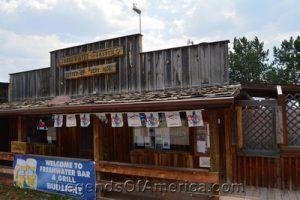 Guffey continues to be the center of activity for nearby ranches, some of which are Park County Historic Landmarks, including the Aspen Creek/Bener/Moore Ranch, Campbell Ranch, and Thirty-One-Mile Ranch. The Freshwater Saloon in Guffey still servin up the suds. Photo by Kathy Weiser-Alexander, 2018. The Bullmoose may not be open all the time, but still serves up some fine eats. Photo by Kathy Weiser-Alexander, 2018. Guffey sits in a very scenic area, created by three ancient volcanoes. The Guffey volcanic center is part of the Thirtynine Mile Volcanic area, the largest remnant of the Central Colorado volcanic field. Two mineral springs a mile south of Guffey featured spring waters bubbling up from large mounds over 20 feet high and 50 feet across. The Skeleton Crew at the Guffey Jail. Photo by Kathy Weiser-Alexander, 2018. 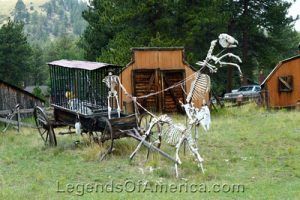 After visiting this quirky, somewhat ghost town in Park County Colorado, it was no surprise to find out that they have a habit of electing animals as Mayor. In fact, the two main political parties are the Democats and the Repuplicans. The latest information I could find while writing about Guffey was that the Mayor was “Monster” the cat, elected in 1998. We’re pretty sure Monster has since passed, so if you happen to know leave a comment below. ©Dave Alexander, Legends of America, September 2018. All Photos available for Prints and Products HERE. Mineral Strike to Meteor Strike: Guffey and the Freshwater Mining District, Steven W. Veatch, Dan Alfrey, Jo Beckwith, Becky Blair, Chris L. Peterson, Wayne Johnston, Maury Hammond and Roger Loest, 2008. Guffey is a great little town. My info is that Guffey is now up to a whopping 49 inhabitants, my sweetie, Brian, being #49. 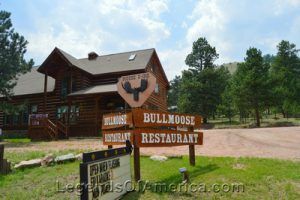 Don’t miss cruising through and stopping for a bite to eat at Rolling Thunder Cloud Cafe, The Bull Moose, or Freshwater. Stop at the Guffey Garage and talk to Bill, the curator of most of the quirky creations there. Definitely worth it!